Mark Spitz never lacked confidence. As an 18-year-old he travelled to the Mexico City Olympics with high expectations but returned home chastened after winning just a silver and a bronze in the individual events. Munich four years on was to be very different. Spitz wanted to better fellow American Don Schollander's haul of four swimming golds at the 1964 Tokyo Games. Then he planned to become the first athlete in any sport to win six Olympic golds. That completed, he wanted a seventh to put himself beyond immediate reach. By September 1, Spitz had won five and a sixth was assured in the final race of the Games, the medley relay. A seventh beckoned in the 100 metres freestyle but Spitz was uncertain whether he could overcome Jerry Heidenreich. Persuaded by his coach to compete, Spitz surprised his team mate by going out at full blast and eventually won by half a stroke. He had done it all, finishing with gold medals from the 100 and 200 freestyle, the 100 and 200 butterfly and from three relays, all in world record time. For 10 days the Games had been acclaimed as a triumph with Spitz the greatest success of all. But then came the hostage horror when 11 Israelis died in a shootout after an attack by Palestinian guerrillas in the Olympic village. Belatedly Olympic security officials realised Spitz was a Jew and, after his record gold medal haul, a prime target. He was still in the Olympic village watching the drama unfold when a group of U.S. Olympic Committee officials came in the room and said they were sending him home. Spitz was driven to Munich airport and boarded a plane to London. "The next morning, the newspaper headlines had the terrible news that all 11 Israelis had been killed and there'd been a shootout between the terrorists and the German police," he said. "I completely freaked out. Here it was, 27 years after the end of World War Two and there were still madmen killing Jews because they are Jews," he said. Spitz returned to the United States a changed man. "It made me aware of my responsiblity to acknowledge that, yes, I am Jewish," he said. "I felt an obligation to affirm my ties as a Jew and to become educated on the issues so I could speak knowledgeably." After making a fortune in endorsements, Spitz settled down to pursue his hobbies of skiing and collecting art. But the competitive fires had not dimmed entirely. In 1990, at the age of 40, Spitz announced he planned to try to qualify for the 1992 Barcelona Games in the 100 metres butterfly. He lost by embarrassing margins in some exhibition swims and reluctantly conceded the inevitable. 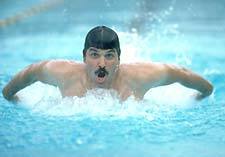 Even the great Mark Spitz could not defy time. Watch out for Phelps in Athens! Who is the world's greatest?